Doors are one of the first things you notice in a home. They add both beauty and value. This is why updating doors is one of the top recommendations for home improvement projects. They are also a key feature you want to showcase when a selling a property. With RoomSketcher Home Designer you can visualize online how different door styles and finishes will look in your home. 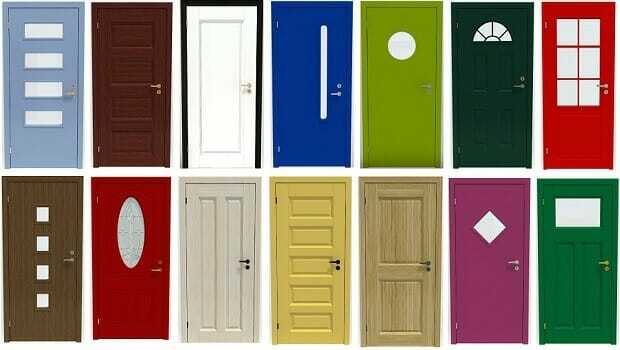 Choose from more than 100 door styles – from traditional to modern, with one panel or many. We have sliding doors, glass doors, panel doors, entry doors and many more. Plus, the size of every door can be easily modified to suit the needs of your project. With the Replace Materials feature you can customize the finish and color of your doors, trim and hardware. There are over 50 wood and metal finishes to choose from. You can match brand name paint colors as well using the custom color picker. The doors styles pictured above are just a few examples of the types of beautiful doors you can create. The Replace Materials feature is a great way to take your home design and project planning to the next level. Visualize how different door finishes will look from room to room, save and compare your options, and create the perfect look to enhance the beauty and value of your home or property. This feature is currently available for doors, windows and stairs. Look for the color wheel symbol in the product library on furnishings that can be customized. This video will to help you get started with selecting, sizing and customizing your doors. All doors are in the Product Library and available to everyone. VIP or Pro Subscribers can customize their doors using the Replace Materials feature. Not a VIP or Pro subscriber yet? With VIP and Pro you get the awesome Replace Materials feature, Live 3D visualization and 2D Floor Plans. How cool is that? There’s no better way to visualize your home or properties. To upgrade your account – see our Plans and Pricing. Find the perfect door styles for your projects and start customizing today!